The Ford Transit Connect is a popular van for cargo and passengers. It features a trailer tow prep package, which includes the hitch as well as advanced technology. The towing capacity is 2,000 pounds. The technology includes stability control, roll control and curve control, helping you to handle any type of road and all weather conditions. 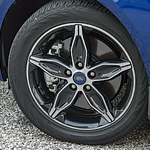 The Ford Transit Connect also has two braking technologies. The hill start assist provides you with the ability to stop the vehicle from rolling backwards when you are stopped on an incline and want to go forward. The emergency brake assist helps you to quickly stop the vehicle in emergencies. At Malloy Ford, our associates can set you up on a test drive of the Ford Transit Connect. Stop by our showroom today to get behind its wheel.